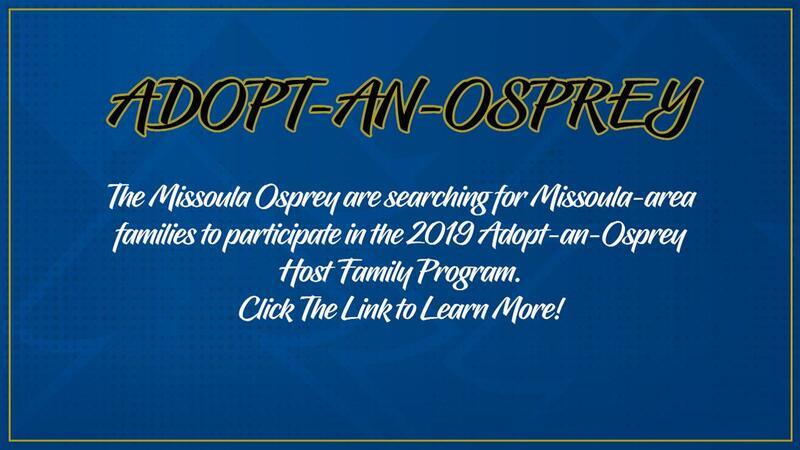 As part of the Missoula Osprey "Adopt-an-Osprey" host family program, the Osprey organization is in need of area families who are interested in potentially housing a player(s) or field staff member for the upcoming 2019 season that begins this June. Each season, Osprey players rely on willing area families to host players and field staff members of the team - in 2019, the Osprey organization is enhancing their current host family program, so any player or field staff member who is looking for a host family, has the opportunity to be placed in one. We have no doubt the new Adopt-an-Osprey program will enrich the lives and experiences of both the players and their host families. As one of the most important aspects of the players' off-the-field development, host families provide members of the Osprey team with a comfortable home, away from home. Often, players representing the Osprey come from various parts of the United States - including many international athletes where English may be a secondary language. Interested families are simply asked to provide sufficient and safe living arrangements, with secondary details such as food, laundry usage, and wireless internet access to be mutually agreed upon by the player(s) and their family. Players are responsible for their own transportation to and from the ballpark (unless otherwise agreed upon) and are asked to obey the rules set forth by their household. Families that live within the Missoula area and within a reasonable commute to Ogren Park Allegiance Field are preferred. Interested families are encouraged to contact the Missoula Osprey at (406) 543-3300 with any questions - and can apply to the Adopt-an-Osprey program via www.missoulaosprey.com or by emailing info@missoulaosprey.com.